The Collection is one of the most varied, in terms of types of locomotive and wagon, of industrial narrow gauge railway items in the UK. Unlike most of the Museum, our collection policy ranges outside the south east of England and encompasses industrial railways from the whole of the UK. (OK yes, I agree, one of our locos is French!). We have three working examples of Hudson Hunslet locos, one powered by the rarer MacLaren two cylinder engine, three examples of the Motor Rail Simplex, two Ruston & Hornsby types (regrettably only one in working order at present), two Lister rail trucks, a single Ransomes & Rapier, one of only two known examples in the British Isles (the other being in Eire) and three Wingrove & Rogers battery electric locomoties which were donated to us by the Redland Brick Company. Hibberds are represented by one of their rebuilds of a Motor Rail (see picture on the first page) and a small Planet which is, at present, off site being restored at a secret location. The collection is rounded off, as far as working locomotives go, by three German built Orenstein & Koppel single cylinder machines, two 2 foot gauge and one 3ft 2¼in gauge. RANSOMES AND RAPIER 80/1937. This locomotive was built new for George Cohen & Sons for use at their Cuba Works in Swansea and was delivered in November 1937. After only a few months, the loco was returned to the manufacturers and then passed to the Chinnor Cement & Lime Co. Ltd. in Oxfordshire in March 1938. Here it was restricted, along with another two Rapiers and a Hunslet, to shunting in the quarries and washmills, the main haulage in the chalk pits being by two rope-worked lines. The railway at Chinnor closed in 1962, and in April 1966, the Rapier was acquired by Brockham Museum, where it was restored using parts of R&R 82 from The Ashover Light Railway. No. 80 came to Amberley along with the rest of the Brockham collection in 1981. 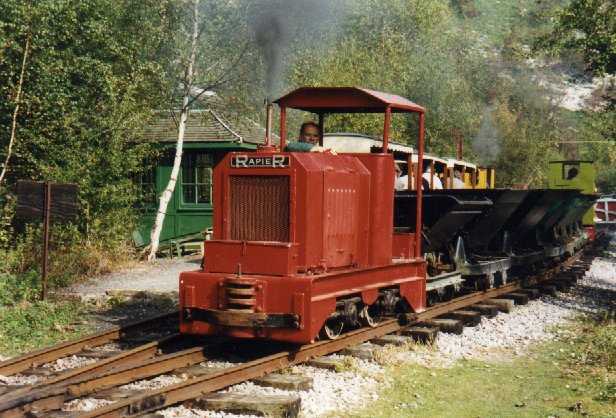 Very few of these machines, by narrow gauge locomotive standards, were built and there are now only two Ransomes and Rapiers still in existence; the other, 84, is still working in the peat industry in Ireland, although it has been heavily rebuilt. The collection has three Wingrove & Rogers (BEV) battery electric locomotives, two of the larger W417 type like WR5034/1953 above, and the smaller W217 type shown below. 5034 worked at the North Holmwood works of Redland Brick (near Dorking, Surrey) and is controlled by a tram type controller. 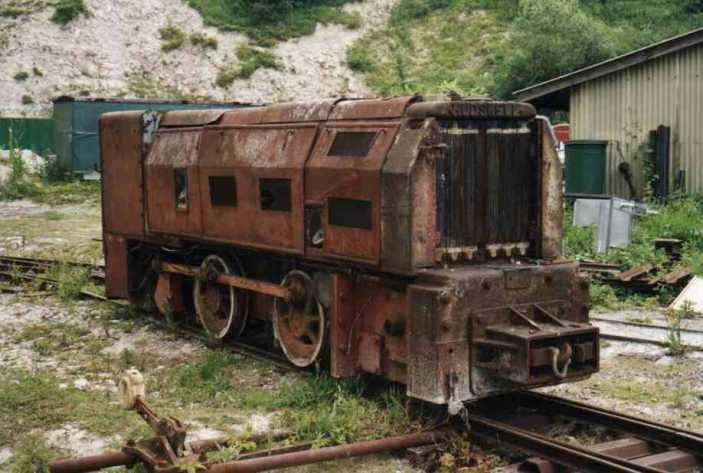 The W217 type (T8033/1979) was only six years old when it passed to the Museum for preservation having worked for a while at Redland's works near Crowborough, East Sussex, before passing to Norh Holmwood as spare locomotive in 1980. When this works closed all three BEVs were donated to the Brockham Museum but were delivered direct to Amberley. 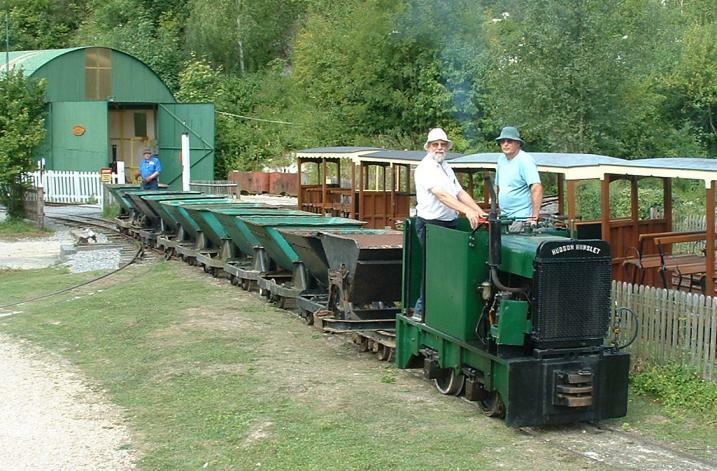 Of the Hudson Hunslet locomotives at Amberley, the one that sees most use is this one. Unfortunately, the works number of this loco is not known - it arrived from Star Construction of Partridge Green, West Sussex in a crate having never been used by them. However, all was not new - various parts had been robbed and swapped. 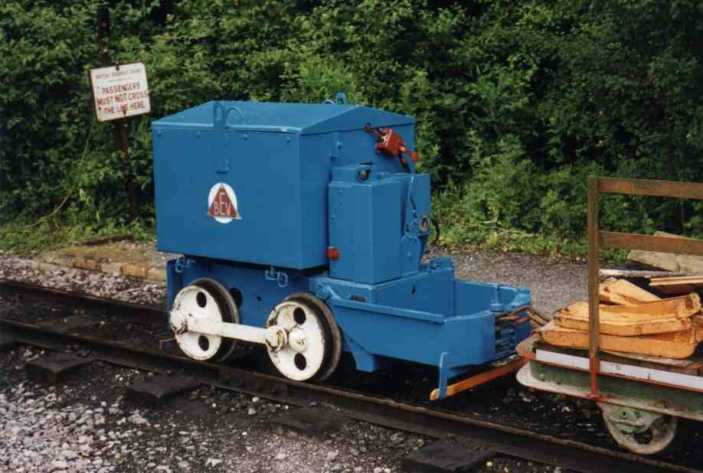 It has been fitted with air brakes for use on our passenger services but here we see "Blue Star" on a long skip train, marshalled ready to receive the next delivery of track ballast. 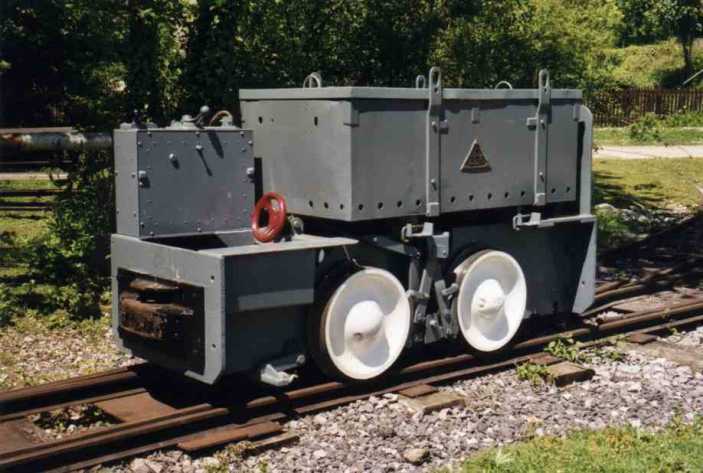 This beast is a Hudswell Clarke mine locomotive (DM686/1948) which worked at NCB's Tillmanstone colliery which was part of the Kent coalfield. It is powered by a Gardner 4LW diesel engine. The locomotive is a long term restoration candidate partly because of its size and complexity and partly because at 11 tons it is slightly larger (!) than most of our other locos.